Well, here we are....the final card for the Endless Birthday Wishes stamp set. I truly hope you are enjoying these ideas. Please let me know. This card uses only the Endless Birthday wishes but involves a little coloring ...I don't know about you, but I love to color. It goes back to when I was a little girl, I always loved to color and that has never changed, now instead of using crayons, I like to use markers LOL. 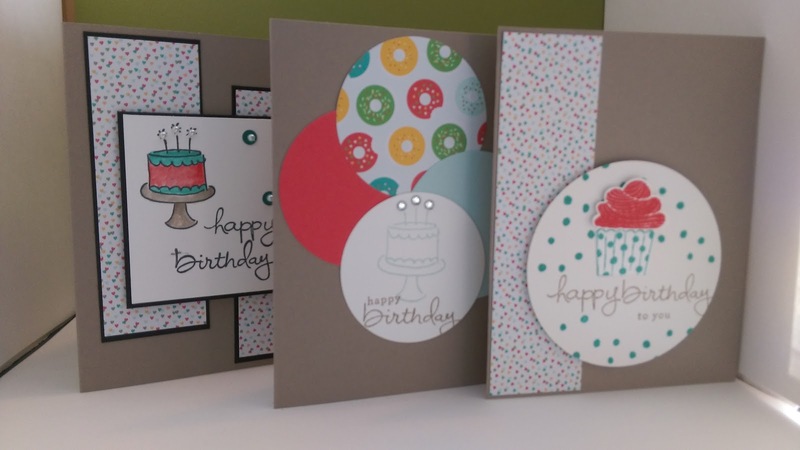 For this card, I created a basic card base from Tip Top Taupe CS, 5 1/2" x 8 1/2" scored at 4 1/4" I then cut 2 Basic Black panels measuring 15/8" x 4 1/8" and 2 panels from the Cherry on Top DSP stack that measure 1 1/2" x 4" and adhered them together using Fast Fuse, I then adhered them to the card base staggering them using Fast Fuse. I then cut a Basic Black square, 3 1/8" sq.and a Whisper White square panel measuring 3" sq. 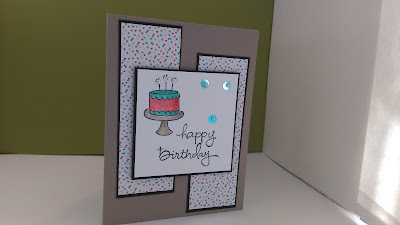 Using Momento Tuxedo Black ink, I stamped the cake image from the stamp set into the upper left corner of the whisper white square and then I stamped the script "happy birthday" also in the Tuxedo Black ink toward the bottom right. I colored the cake using blender pens, Tip Top Taupe ink, Watermelon Wonder ink, and Bermuda Bay ink.. I added some Bermuda Bay sequins and a few Basic Pearls for a little sumthin' sumthin' and I adhered the square panel to the card using Stampin' Dimensionals. So that's it for the Endless Birthday Wishes. Pull this set out if you have it and see what you can come up with, and if you don't have it yet, what are you waiting for?? This set is just as the name indicates...Endless!